Not every rookie can step on the field and produce from day one. As we’ve seen time and time again, having a poor or even awful rookie season doesn’t mean someone is a surefire bust. Jared Goff, Davante Adams, Jake Matthews, Stephon Tuitt, Kyle Fuller, and Landon Collins are a handful of recent examples of players who looked out of their depth as rookies only to become some of the best at their respective positions. Let’s take a look at some of those high draft picks who fit the underperforming bill at the moment and examine what they need to show over the rest of the season to give fans reason to be excited in the future. While injuries have impacted Miller’s performance as a rookie, his performance before those injuries wouldn’t be classified as ‘good.’ Miller’s play strength issues aren’t going to be corrected during a season, and that has to be something that develops throughout his career. However, his flaws in pass protection can and need to be fixed. He’s allowed 11 sacks already this season, many of which came via inside moves. The elite tackles in the NFL almost never get beaten cleanly to the inside as forcing edge rushers to run the loop creates cleaner pockets. Another player that has dealt with injuries, Price hasn’t been fully healthy all year. After tearing his pectoral muscle benching at the combine, Price would return only to suffer an ankle injury in Week 2. His play since returning has been unsurprisingly sub-par. What I want to see moving forward is at least some of the same nastiness in the run game we saw at Ohio State. So far, Price’s highest single-game run blocking grade is a measly 65.6 from Week 11 against the Ravens. If you just looked at his stats, you might guess that Washington hasn’t seen the field much this season. In actuality, he’s been on the field for more pass plays this year than D.J. Moore. Moore has 609 receiving yards though, while Washington has only 77. I get that it’s going to be difficult to steal targets from studs like Antonio Brown and JuJu Smith-Schuster, but Washington has to be more efficient when he is targeted going forward. He’s only hauled in eight of his 23 targets and most notably butchered what should have been an easy touchdown on an out-and-up against Denver. For a receiver billed as a deep threat coming out of Oklahoma State, he has to at least show something in that regard. 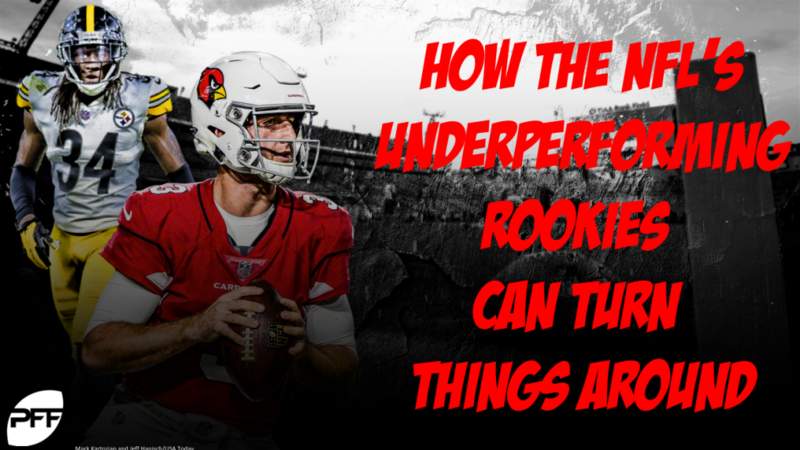 Rosen has already flashed high-level throws in his rookie season. Now we simply need to see him be more consistently accurate with the football. His 67.2 adjusted completion percentage is fourth-worst among starting quarterbacks, and it hasn’t been because he’s targeting too many difficult throws. Rosen has a mediocre average depth of target of 8.7 yards downfield. He needs to take and make the easy ones more often going forward. While Penny’s yards per carry average has rebounded, it’s been because of a handful of big plays. His inability to consistently churn positive yards is why Chris Carson continues to see the bulk of the carries in Seattle. Almost half of Penny’s 369 yards this season have come on just eight carries, while 17 of his 73 runs have gone for zero or negative yards. Cutting down on the latter will go a long way towards seeing him get more touches in Seattle. Since coming off I.R. after a toe injury kept him out the first nine weeks of the season, Lewis has been relatively ineffective starting on the edge. He’s seen at least 40 snaps in each of the Colts’ four games since, yet has registered a win rate of just 10.2% as a pass-rusher. That figure ranks 16th among rookie defensive linemen and 127th among all defensive linemen with at least 100 pass-rushes on the season. This week will be key for Lewis. If he can’t beat up on Texans’ left tackle Julie’n Davenport – the lowest graded starting left tackle in the NFL – there’s little hope this season. With Edmunds, we’ve already seen the playmaking ability in coverage, as his five pass breakups are the fourth-most of any linebacker in the NFL this season. What he has to clean up is his tackling. Edmunds’ 15 missed tackles so far are the fourth-most of any linebacker and nine of those have come in coverage. Wrapping up more consistently will take his game to the next level. While his brother has struggled with finishing plays, Terrell has struggled with making them altogether. In 455 snaps in coverage this year, Edmunds has all of four stops (46 other safeties have more), and three forced incompletions (28 other safeties have more). The 21-year old was drafted because of his rare physical tools, but we’d like to see them translate to ball-hawking ability at some point this year. It’s difficult to blame Davis too much for his struggles as a rookie. His biggest strength coming out of Auburn was his press man ability, and he went to a team in Tampa Bay that has played man coverage at a rate below league average. Still, one can’t just line up in press man every snap, and a corner needs more skills in his toolbox than that. On the season though, Davis has gotten his hand on only one pass on 45 targets. With his size (6-1, 206 pounds) and physicality, we’d like to see a few more before seasons end. Any run that isn’t aimed directly at Vea has seemingly given the first-round nose tackle fits this season. He’s also not come close to being able to consistently push the pocket as a pass-rusher with all of 12 pressures on the season. The former can be coached, while the latter needs to turn around quickly. At almost 24-years old, Vea isn’t going to develop too much more physically, so if the bull-rush isn’t working now, it may never. The good news is that Vea’s two highest-graded games have come the past two weeks as he’s recorded multiple pressures in both.